The program for preschool children was begun in order to offer a place of safety for 3-6 year olds mainly from disadvantaged families. The program can take up to 20 children. The activities take place daily and cover the curriculum laid down by the Ministry of Education. 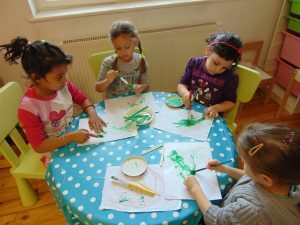 The goals of the program are to develop the children’s knowledge and understanding of the environment, to develop language and numerical skills , to provide musical and artistic education, physical education, the development of self-discipline, of self-esteem, of age-appropriate behaviour, and of practical and fine motor skills. Educational, practical and leisure activities: stories, physical education, songs, games, outings etc. Social assistance: assessment, counselling, mediation, monitoring through home visits etc. Staff: Kindergarten teacher, educational psychologist, students from the Romanian Studies Program.